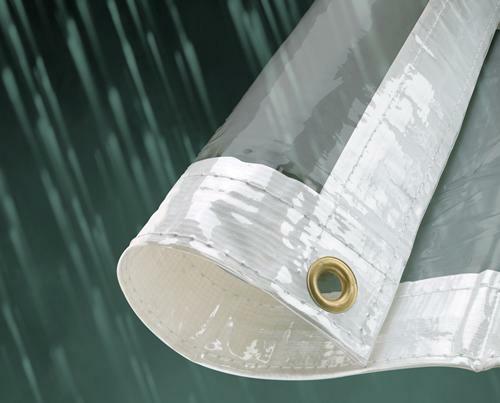 The glass clear pvc tarpaulin is excellent for when protection is required along with full transparency. A popular use for this heavy duty cover is to protect the interior of a stall from wind and rain, whilst still allowing customers to see the products when laid over stock, such as fruit, during bad weather conditions and also provide maximum light penetration. 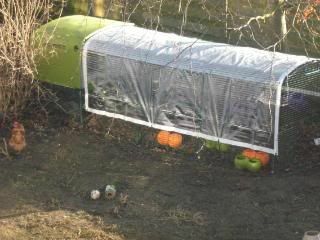 Furthermore it can be used to shelter outside pets and chickens by placing the sheeting over the cage or coop. However avoid covering cages during sunny weather as the internal temperature may rapidly increase. 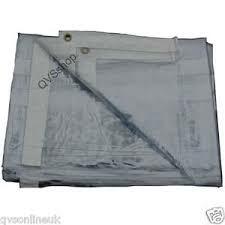 There are many other situations where this tarpaulin can be used such as at boot fairs, fetes, and other outdoor events and venues. Manufactured from 310gsm PVC, this item is extremely tough however only 0.26mm thick. Therefore it is stress free to handle and folds up with ease, avoiding problems during transportation. 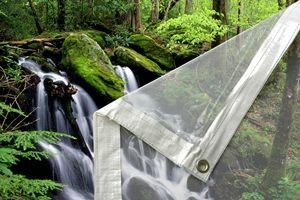 Furthermore it is 100% waterproof and even though the majority of the groundsheet is a single piece of PVC it is stretch and tear resistant. Brass eyelets have been inserted in to each corner as well as every metre in the white banded, reinforced hems along every side. Eyelets in every corner and at 1 metre intervals. Double-stitched or heat sealed hems. I ordered a total of 4 clear tarpaulins. They were delivered promptly and I am very satisfied with the quality.